KION Holding 1 GmbH owns all the shares in KION Holding 2 GmbH, which in turn is the sole shareholder of KION GROUP GmbH. KION GROUP GmbH manages the brand companies as the strategic management holding company and operational parent company. In this report, 'the KION Group' refers to all the companies of the KION Group collectively. The KION Group pursues a multi-brand strategy so that it can optimally cater to the different market and customer requirements. The Group is represented in the markets by its Linde, Fenwick, STILL, OM, Baoli and Voltas brands. They each have different areas of focus in terms of regional presence and factors such as product range, services and technological expertise. In addition to its industrial truck business, the KION Group operates in the hydraulics sector through its Linde Hydraulics brand. KION GROUP GmbH acts as a strategic management holding company and is responsible for key head office functions, for which it defines Group-wide business standards. Strategic, financial, and market-specific objectives are agreed separately with the individual brand companies and monitored. These companies have full operational and commercial responsibility for their activities and for achieving the agreed objectives. 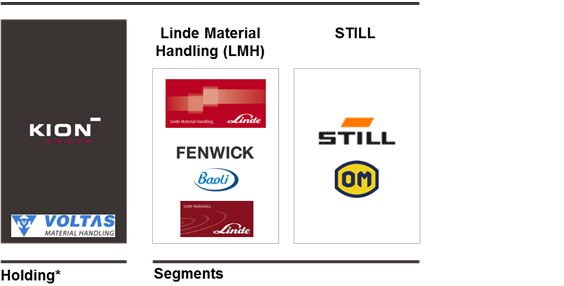 The operating segments of KION Group pursuant to IFRS 8 are Linde Material Handling (in which Baoli, Linde Hydraulics and the French brand Fenwick are managed) and STILL (in which the OM brand is also managed). In 2011, the KION Group integrated Voltas Material Handling Ltd. – in which it holds a majority stake – into the 'Other' segment.